Brief description of technology: Featuring Bio-architect Michael Rice, Bio-Architecture is the pure principle set of rules for design, construction and land use, which utilizes the necessary 'fractal' symmetry / shape of electric fields which allow all living systems to thrive. It is a revolution in urban design and community planning which can be scientifically proven by measurement. Understanding the geometrical patterns, fractality and mathematical proportions that create life in order to build and design with, has been largely forgotten in the world. We how have dead and sick buildings, that block our potentials. Benefits and features: Spiritual geometry is a universal language of truth, harmony, beauty, proportion, rhythm and order. Architects and designers draw upon concepts of sacred geometry when they choose particular geometric forms to create pleasing, harmonious, and spiritually uplifting spaces. The shapes and patterns of sacred geometry contain the laws of creation and give evidence of a profound order and sublime beauty that exists on the archetypal planes. 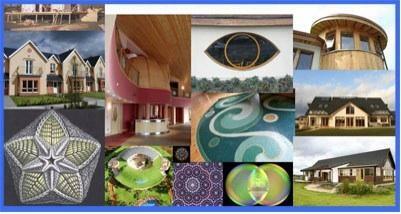 Stage of development: Online resource for building and space designs based on the natural harmonic principles of biological architecture, sacred geometry and feng shui. Investment opportunity: Bio-Architecture is a concept promoted by Roger Green's International Sacred Geometry and Ecology conferences, held in several locations over the last 12 years. It was a term created by Dan Winter, who has inspired many eco-architects to follow the ways of nature and integrate her principles into LIFE forming Architecture. These concepts are also incorporated into Bloom the Desert projects. We call it the healing architecture of the future. Extra Info: The ultimate goal of biologic architecture is to create fractal charge fields that are implosive in nature and encourage life, positive DNA resonance and charge implosion (the electrical principle of life itself).